Recently in the rare book cataloging department at the University of Pennsylvania, a not-very-exciting-looking red two-volume set appeared at the top of my stack of books to catalog in the French Culture Class Collection. From a cursory look at the volumes, I could see it was a collection of items in various formats–published pamphlets, newspaper clippings, and manuscript letters–bound together and all on one topic. 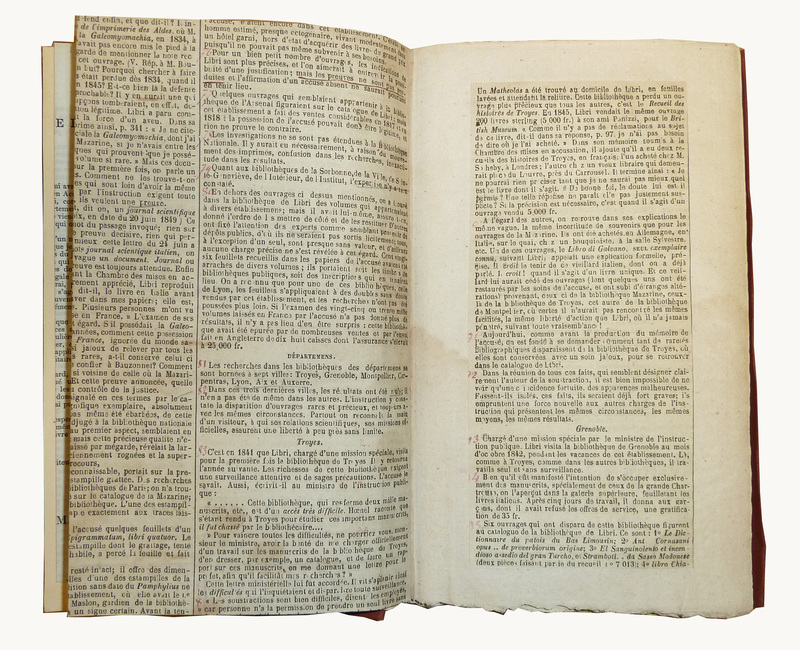 Both volumes had a manuscript table of contents at the front. At the start, we didn’t know what the subject of the collection was, who compiled it, or where and when the library acquired the collection. In rare book cataloging at Penn, we’ve begun to create finding aids to describe some of the more unusual items in our collections that warrant further description than we can fit into a traditional catalog record. This set seemed like a perfect candidate to be described in a finding aid because of the variety of items it contained and the manuscripts letters, which would hopefully warrant more in-depth description. I delved into the collection, and it didn’t take long to realize that Procès Libri. Détournement de manuscrits, d’autographes, et de livres: jugement – polèmiques is a fascinating set: all of the items are on the subject of the book thief named Libri; many written by his ardent supporter who went by the name of Bibliophile Jacob; several of the pamphlets are inscribed by their author; manuscript letters from Libri, his lawyer, and a supporter about missing incunabula are pasted in; it tells a story better than fiction. Guglielmo Libri-Carrucci dalla Sommaia, shortened to Libri, was an aptly named Italian count, scholar, mathematician, bibliophile, professor, book collector, book seller, library inspector, and most notoriously, thief of rare books and manuscripts from the French national libraries. Libri’s passion for books drove him into tempting situations that no bibliomaniac of his proportion should have to endure; as inspector of French provincial libraries tasked with cataloging the most disorganized manuscript collections in the country, Libri was often left unattended, sometimes after hours, with some of the most precious and obscure items in the French libraries. As a trusted government official and well-known scholar, many librarians were both charmed by Libri and apt to turn a blind eye as they noticed him, for example, spending far too long with Italian scientific printed books when his job was to catalog the manuscripts, or when he slipped into a back room for librarians only where duplicate and uncatalogued items were kept, or when one or two items went missing after his visit. Libri was born in Florence in 1803. He excelled in math and science as a young man and was appointed Professor of Mathematical Physics at the University of Pisa at the age of twenty-one. 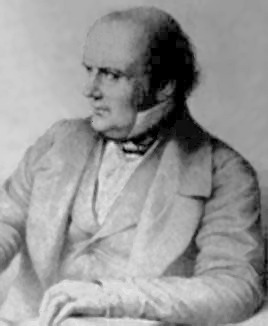 Due to political activity, he was exiled from Italy in 1831 and settled in Paris, where he was already well connected and regarded in the scientific and academic communities from previous visits. Libri was able to become a French citizen, which allowed him to begin teaching at the Collège de France. 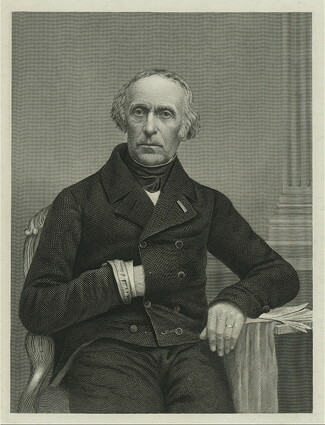 Shortly after, he was appointed to a position at the Sorbonne and was elected as full member of the Académie des Sciences, with the help of his friend Dominique François Arago, the astronomer and radical politician, who was then the secretary of the Académie des Sciences. Libri had always been a lover of books and a book collector, and as he undertook a project to write a complete history of science in Italy, Histoire des sciences mathématiques en Italie, he became known as the leading collector of scientific and mathematical books and manuscripts of the time. By 1841 Libri estimated his collection to contain 1,800 manuscripts, and in 1847 he estimated his printed books to number 40,000 volumes (Ruju and Mostert 162 and 166). During his research in French libraries, Libri began to critique the way libraries handled rare books and manuscripts. He criticized libraries for losing books, for leaving them unattended, for purchasing stolen books, and for theft by employees blamed on patrons. At this time French libraries were in a general state of disarray. The Bibliothèque Royale in Paris was in the difficult process of becoming a public institution, the Bibliothèque Nationale. The provincial libraries had been chaotic since the French Revolution, when thousands of books and manuscripts had been seized from clergy and aristocracy and brought to the provincial libraries, where the librarians were so overwhelmed that scores of volumes were either stolen or seized for the Bibliothèque Nationale by bibliographers sent from Paris. Libri was able to take advantage of this chaos. Libri’s good friend François Guizot, a historian, professor, and the Minister of Public Instruction, was beginning to enact more regulations on the French public libraries. Libri suggested to the Minister that a commission be formed to investigate the manuscript collections of the provincial libraries and create catalogs of their holdings. 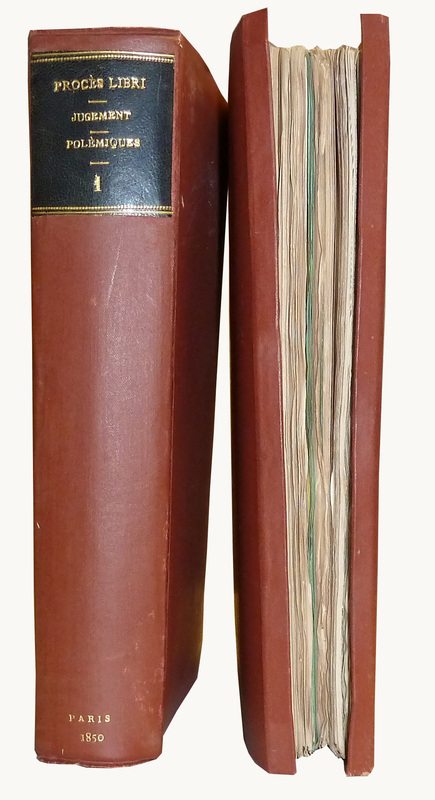 The end result would be a published catalogue of the complete manuscript collection of the French public libraries. By 1842 Libri was appointed as the Secretary of the newly formed commission, as well as one of the inspectors. With this new position, Libri was given increased access to manuscript collections of the provincial libraries throughout France, staying for extended periods, looking at collections unsupervised, and asking librarians to allow him to work after hours and send manuscripts to his home to look at more closely. It is during this four year period that Libri is accused of stealing countless books and manuscripts from the French public libraries. 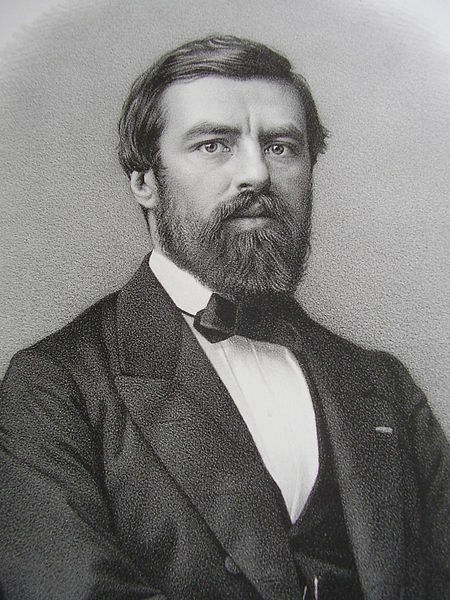 Libri retired from the commission in 1846, having contributed only to the first volume of the Catalogue Général des Manuscrits des Bibliothèques Publiques des Départements, which was published in 1849. Libri not only stole books, he did much to conceal his thefts, such as improvising his recollections and receipts of actual book purchases to include items acquired illegally, removing identifying marks like library stamps, and rebinding and restoring books to remove marks of ownership and appear like a different copy. He sent books to Italy to be bound in an Italian style to hide their provenance, and he forged inscriptions on some of his books and manuscripts to add to their value. Libri also collected old paper and had restorers add blank leaves to the front and back of books so he could sell them as “perfect” copies, and he was even found to have added false title pages and altered title pages to either increase a book’s value or confuse its identity. Mounting suspicions and anonymous accusations about Libri’s thefts to the police led to an investigation into Libri that lasted for several years. Libri was convicted of theft in the Acte d’accusation of 1850, yet he was tipped off to impending legal action against him in time to flee Paris for London, first burning incriminating papers in the fireplace of his Paris apartment, sending 18 crates of books to London, and stashing the remaining papers and books. Libri was sentenced in absentia to ten years imprisonment, but he refused to return to France to stand trial or serve the sentence. He lived the remaining years of his life in London and continued to collect and sell books. 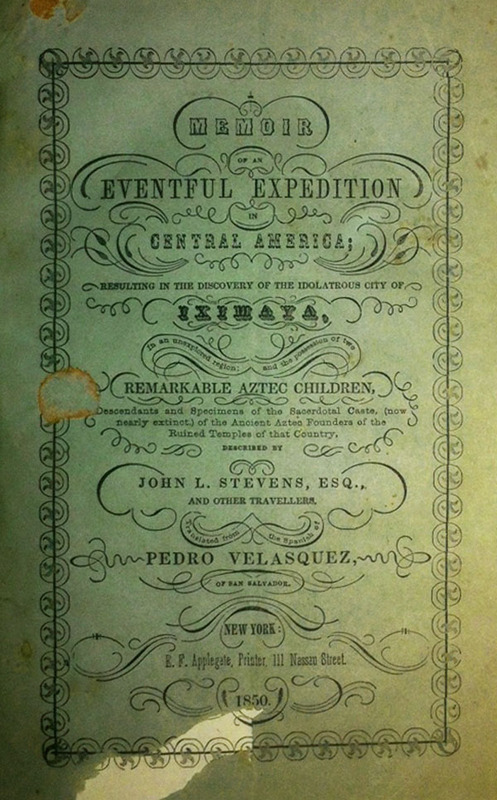 He sold a large collection of manuscripts at an auction conducted by Sotheby and Wilkinson in 1859 (see the title page of the sale catalog below, item 27 of Procès Libri). Note the description of Libri as “the eminent collector, who is obliged to leave London in consequence of ill health, and for that reason to dispose of his literary treasures.” Libri did not in fact move from London until the year before his death about a decade later, and he held a series of ten auctions in London between 1849 and 1865, which helped fund his new collection (Ruju and Mostert 290). Libri passed away in 1869, and it wasn’t until years after, in 1883, that his guilt was absolutely proven. Léopold Delisle, the head of the Bibliothèque Nationale from 1874 to 1905, was able to prove that 166 of the items that Libri sold to Lord Ashburnham in a large sale in 1846 had originally belonged to French national libraries, and those items were eventually returned to France. One item that had been subject to Libri’s misdeeds was recently discovered in the library of Haverford College, a letter from Rene Descartes to his friend Marin Mersenne, dated 1641, about the approaching publication of Descartes’ Meditations on Metaphysics. This letter is one of seventy-two Descartes letters stolen by Libri from the Institut de France. It was purchased by a graduate of Haverford College and a collector of autograph letters, unaware that it had been stolen. The collector’s wife donated his collection to the college in 1902. Haverford College returned the letter to the Institut de France in 2010 when they learned of its history. Libri also made off with leaves from the Institut’s manuscripts of Leonardo da Vinci, which were shown in the Acte to have disappeared immediately after Libri looked at the manuscripts and some of which were included in Libri’s sale to the Earl of Ashburnham. Leading up to and for years after his official indictment, Libri and his supporters wrote pamphlets in his defense, disputing individual claims of theft and arguing that the chaotic state of French libraries led to library books finding their way into the private market all the time, and that librarians were not fully aware of what their collections contained because of poor or incomplete catalogs. Libri tried to build arguments in his defense with the little evidence and records he had with him in England, employing friends in France to do research in libraries into some of the books and manuscripts in question. His supporters included Guizot, the medievalist professor Achille Jubinal, the author and journalist Paul Lacroix (Bibliophile Jacob), the bibliographer Gustave Brunet, and the historian and author Prosper Mérimée. The collection Procès Libri contains twenty-five of the published pamphlets written both before and after Libri’s indictment in 1850. The manuscript letters included in our collection make it even richer. The first manuscript note (item 1 of Procès Libri) is a letter in a small hand covering four sides of a folded leaf, with the writing getting tinier and tinier as the letter progresses. The following leaf of tome one has two manuscript notes pasted down, the first is a note with a numbered list of incunabula, followed by “Bibliothèque Mazarine” and then what seems to be a checklist of bibliographic details to confirm. While the salutation of the letter is merely to “Monsieur,” the final page has the name and address of Henri Celliez. The manuscript address of Celliez on the third item appears to be in the same hand that wrote the letter, Libri’s hand, and we gather that it may have been excised from the envelope that contained Libri’s letter. The head of the letter is dated “Londres le 12 avril 1851, 14 Avenue Road, Regents Park.” In a darker pen and a different hand, we think the hand of Celliez, is the note “Repons 17 avril 1851”, a note about when Celliez responded to Libri’s letter. This letter concerns the accusation that Libri stole the 1475 Bologna edition of Petrarch’s the Trionfi from the Bibliothèque Mazarine. Libri explains to his lawyer that his friend, the bibliographer M. Silvestre, has visited the library and found the same edition of the Trionfi to still be present on the shelf of the library. In this letter Libri asks his lawyer to contact Silvestre and visit the library with a witness to verify the discovery. The letter is an example of how Libri, once in London, used friends in France to gather evidence for him from French libraries as well in the papers and books he left behind. The complete transcription of the letter can be seen on the Penn Provenance Flickr site. 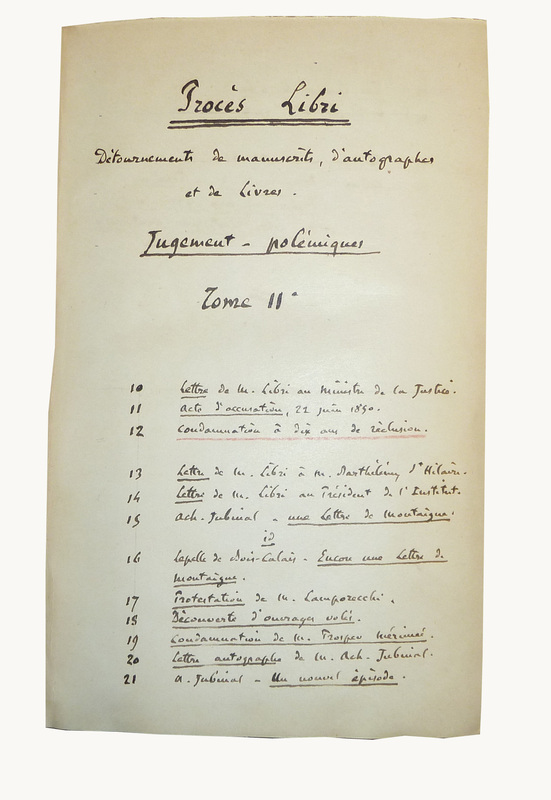 The item that follows Libri’s letter, which we believe to be Celliez’s notes after receiving Libri’s letter and conferring with Silvestre, lists the Trionfi along with other texts Libri was accused of stealing from the Bibliothèque Mazarine, followed by seven points to research about the texts. While Libri and his supporters later touted the discovery of the Trionfi by Silvestre as evidence of Libri’s innocence, it was subsequently shown in a report by Senator Bonjean in 1860 that the Bibliothèque Mazarine had in fact owned two copies of the same edition of the Trionfi, so the presence of one did not disprove the accusation that Libri had the other copy. The collection Procès Libri is particularly fascinating in light of the recent scandal of thefts from the Girolamini Library in Naples by the library’s director, Marino Massimo De Caro, another powerful and connected official who allegedly took advantage of his position to profit from the cultural heritage within libraries. De Caro is accused of plundering the Girolamini Library while employed as its director, selling off hundreds of its books, as well as dealing in forgeries of rare texts. In behavior that vividly harkens back to Libri, De Caro has also been accused of stealing a copy of the Sidereus nuncius of Galileo, printed in 1610, while visiting the National Library of Naples in his role as advisor to the Minister of Cultural Heritage, and substituting a forgery in its place. Libri’s role in the history of French libraries is peculiarly dichotomous; he is known as a book thief of grand proportions who sold off France’s precious manuscripts abroad to perhaps never be retrieved, but also as an extraordinary book collector whose critiques of French public libraries influenced the improvement of library organization and increased care of rare materials. Please see the finding aid for the collection Procès Libri, with further information about Libri and more details on the collection. Ruju, P. Alessandra Maccioni Ruju and Marco Mostert. The Life and Times of Guglielmo Libri (1802-1869). Hilversum: Verloren Publishers, 1995. The Case of M. Libri. Reprinted from “Bentley’s Miscellany,” for July 1, 1852. London: Richard Bentley, 1852. McCrimmon, Barbara. “The Libri Case.” The Journal of Library History. 1:1 (1966): 7-32. Abby Lang is a bibliographic assistant in the Rare Book Cataloging department of the University of Pennsylvania, currently working on cataloging French titles in Penn Libraries’ Culture Class Collection. She is a recent graduate of the Master of Library and Information Science program at Drexel University.